Most of us have observed that ocean wave heights and characteristics at different nearby beaches can vary greatly (such that surfers recognize particular beaches as special spots with their own names) even when the deep water swells are uniform and consistent. Seismic waves are similarly modified by local geological conditions. These variations are known as site effects, and they can strongly influence the nature and severity of shaking at a given site. Site effects include the following five factors. 1) The softness of the soil or rock beneath a site. The elastic properties of Earth materials ranges from hard (difficult to deform--think granite) to soft (relatively easy to deform--think mud). Seismic waves travel faster through hard rocks than through softer rocks and sediments. As the waves pass from deeper harder to shallow softer rocks they slow down and get bigger in amplitude as the energy piles up. The softer the rock or soil under a site is, the larger the wave. Softer soils amplify ground motion. 2) The total thickness of soil to bedrock. Related to the direct amplification effects of soft Earth materials, the geometry of the soft deposits can further distort ground motion at soft rock sites. 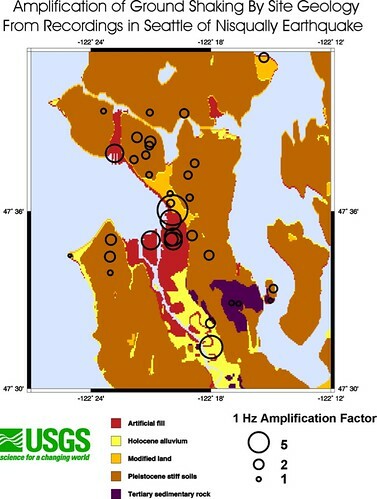 Seismic waves entering sediment-filled valleys, such as the Duwamish River Valley, can trap seismic energy such that it reverberates like sound in an echo chamber. This can lead to both higher amplitudes and longer durations of shaking. Because such effects are geometric in nature, they depend on the characteristics of the incoming wave, and it's direction of approach they can be very difficult to predict. 3) Sedimentary basins (deep geologic structure). This is essentially the same process as #2 above, but at a broader scale. 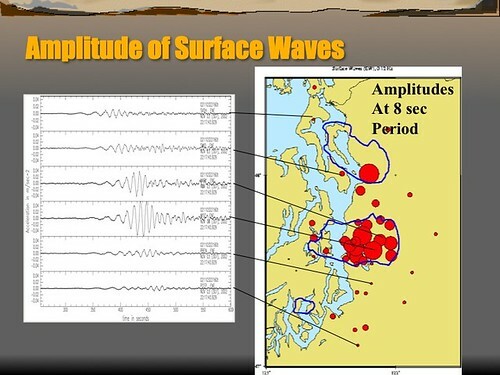 As such, it impacts the lower frequency seismic waves, and can have more widespread effects and influence larger structures that tend to be more sensitive to low-frequency motions. Deep sedimentary basins can have a large effect on ground motion above them. Earthquake waves traveling at high velocity through the stiff, crystalline rock of the crust refract and slow dramatically when entering the basin. This increases the amplitude of the earthquake waves, and the sharp density contrast of the soft basin rocks with surrounding material can cause waves to reflect, trapping energy in the basin for a period of time. This extends the duration of shaking. Due to their size, these deep geologic structures can influence shaking over a wide area. 4) Ground failure potential (see Liquefaction and Landslides). Ground failures can be as spectacular as a large landslide or much more subtle where sub-surface liquefied soils lead to differential settlement of a structure above, but the results of both types of failure can lead to large losses. The features present at the Earth's surface have also been identified as having an influence on shaking intensity. 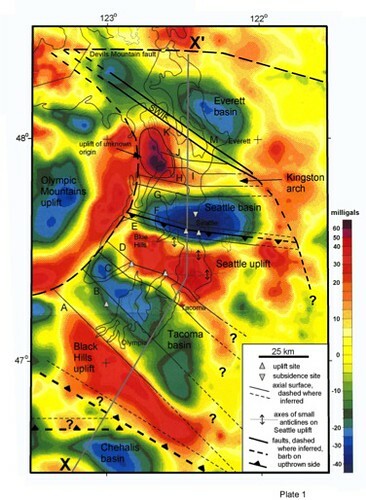 Some studies of the distribution of the intensity of shaking experienced in an earthquake concluded that hilltop sites often shook at one intensity level higher than nearby sites with flatter topography.